Helen Hull Hitchcock was founding director of Women for Faith & Family and editor of its quarterly journal, Voices. She was also editor of the Adoremus Bulletin a monthly publication of Adoremus - Society for the Renewal of the Sacred Liturgy, of which she co-founded. 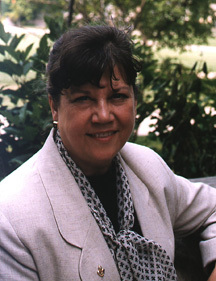 She is survived by her husband James Hitchcock, professor emeritus of history at St. Louis University and their four daughters and six grandchildren. She has published many articles and essays in a wide range of Catholic journals, and is the author/editor of The Politics of Prayer: Feminist language and the worship of God, (Ignatius Press 1992), a collection of essays on issues involved in translation. She has contributed essays to several books, including Spiritual Journies, a book of "conversion stories" (Daughters of St. Paul). She also lectured in the US and abroad, and has appeared frequently on radio and television, representing Catholic teaching on issues affecting Catholic women, families, and Catholic faith and worship. "Familiaris Consortio - on the Role of the Christian Family in the Modern World"
This is devastating news. Helen is one of the few people I consider irreplaceable. She was a great mentor to me as well as a good friend. Helen Hull Hitchcock was a true Daughter of God. I recall a visit to her home, early in my association with Women for Faith and Family, where she showed me a stained glass window in the little room set aside for her prayer. Everything Helen did for the Church began with prayer. Helen's love for the Church was fierce. It could never be business as usual in the Hitchcock household when the Church was maligned. Helen had a warrior's heart and feared no battle to defend Holy Mother Church. Helen Hitchcock inspired so many of us. She taught me the value of taking action, no matter how great the odds against victory--because the Victory is in God's hands, not ours. She is irreplaceable. Helen's death leaves us all terribly bereaved. God will reward her for the great and good work that she has done, for her faith, her example, her courage and the warm charity she showed to all. Helen had patience and great good humor, and was a wonderful companion. She spoke on controversial issues - the role of women in the Church, the debates on abortion and the sanctity of human life - with conviction and with knowledge, always teaching the full Catholic message and never with anger or with ill-will to those whose understanding was less than hers or who opposed the Church. I remember with gratitude the wonderful hospitality given to me by the Hitchcocks’ when I was in St Louis, the house full of books and music, wonderful meals around the family table, and conversation so interesting and so exciting that it was extremely hard to finish the evening and accept the necessity of going to bed...a family united in faith and in affection, with a welcome that was a joy for every guest. Helen leaves us with a vision of Christian women's authentic role in the Church and in society: forward-looking, active, joyful in adherence to the Catholic Faith and the consistent and unchanging teachings of the Church, and keen to evangelize. Helen Hull Hitchcock was one of the most remarkable persons that I have ever known. I have valued her friendship and leadership for more than 30 years. She was an amazing witness to the faith and a true evangelizer. Her many gifts and talents, her great intelligence, her leadership and her insights into the nature of the crises, ( especially the feminist crisis) facing the Church and the culture provided a light in the darkness for so many. She loved truth, goodness and beauty and knew that the foundation of all these essentials was found in the Church founded by Jesus Christ.